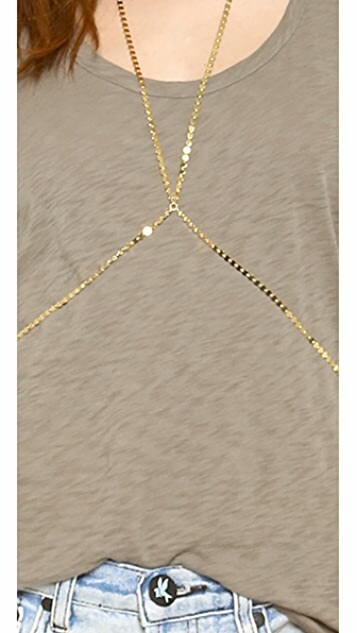 This Jacquie Aiche body chain is made from flat, high-gloss discs for a reflective look. Lobster-claw clasp. "A woman's natural beauty can be illuminated by the right piece of jewelry," says designer Jacquie Aiche, who sees jewelry as a personal, wearable art that can bring out different aspects of a woman's personality. Her own whimsical disposition and her uncommon upbringing are reflected in her jewelry: her Egyptian father and Native American mother inspired her to rework ancient designs in turquoise, fossils, and minerals. The result? Stunning, handcrafted pieces that make the wearer feel utterly unique.